New York University may enter the public approval process for its new Silver Towers site, the crown jewel of its wildly controversial 2031 expansion plan. The biggest hurdle for the school will be gaining approval from the Landmarks Preservation Commission, which will have final say on whether NYU can build on the landmark Bleecker Street site. The proposed building will be a "slender pinwheel tower," and is rumored to be planned for a 40-story structure. New York University dropped in on Community Board 3's zoning committee meeting and had little to say about how its 6 million-square-foot expansion plan might affect the East Village. Much of the expansion would be focused elsewhere, like in Washington Square Park and Governors Island. However, there's still about 700,000 square feet of expansion unaccounted for under the current proposal. After the Empire Fulton Ferry Park closed for renovations at the beginning of the year, residents were wondering why no work was being done on the Dumbo waterfront space. A conflict between state and local officials caused the project to hit a standstill, with the State Comptroller denying construction approval for the project. While pre-recession financial institutions won’t celebrate their headquarters, the recent unveiling of Goldman Sachs' new main office at 200 West Street reflects a distinctly different approach. The 43-story building contains no images of Goldman's name, including signs or even insignias on the security staff's lapels, a stark contrast to the days of headquarters bearing names like One Chase Manhattan Plaza. The Brooklyn neighborhood long known for its toxically polluted Gowanus Canal, could sustain an extra 1,500 to 2,000 residential units, once the Environmental Protection Agency-mandated canal cleanup goes through. The residential rebirth could take years and millions of dollars, with estimates that the canal cleanup cost at $400 million. Negotiations have started up again between the Hotel and Motel Trades Council and Dean Poll, the newly-selected operator for Tavern on the Green, the city-owned landmark eatery. Negotiations had reached an impasse over Poll's initial worker proposal, which the union found inadequate. The city's still-burgeoning list of stalled construction projects appears to be letting up, with 364 project sites having restarted construction work since February 2009. Of those projects, 94 have been completed. Most were residential and in either Brooklyn or Queens. DOB Commissioner attributed the restarts to a new citywide program that allows developers to extend their building permits for four years in exchange for adhering to stricter safety regulations. In the past, developers had to start the permits process from scratch after one year, which contributed to delays. 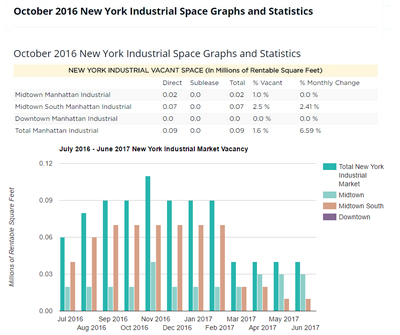 As of April 25, the city's list of stalled construction sites stood at 576, up from 515 stalled sites at the end of November. MSG plans to shut down the arena for three consecutive summers starting in summer 2011 while the accelerated renovation effort, which includes refurbished seats and suites, takes place for the approximately $800 million arena renovation. Madison Square Garden would move one block west under a revived proposal that is gaining traction amongst arena and city officials. MSG's 5,600-square-foot theater is to close temporarily at the end of June for the first stage of construction. The renovation would be more expensive and disruptive than building a new arena altogether. The Brearley School has purchased three buildings at 70-74 East End Avenue on the corner of 83rd Street. Brearley plans to keep its current location at 610 East 83rd Street between the FDR Drive and East End Avenue, half a block away from its new buildings. A proposed 13-story mosque and Islamic cultural center near Ground Zero was approved by Community Board 1's financial district committee despite grumblings from some who said the project was offensive for families of 9/11 victims. The $100 million glass-and-steel Cordoba House would be built on the site of the old Burlington Coat Factory, at 45 Park Place near Broadway, and would have a 500-seat performing arts venue, swimming pool and basketball court in addition to the mosque. The 150-year-old building that must be torn down to make way for the religious center may be architecturally significant and has been in consideration for landmark status for decades. The local community board plans to vote on whether to evaluate the building's architectural significance. The attorney general has given the go-ahead to Trump Soho, allowing the developers to proceed with closing deals. The offering plan for Trump Soho has been declared effective and closings can now begin. The 391-unit, 46-story building at 246 Spring Street has faced a series of troubles since breaking ground in 2007. Closings were supposed to begin by mid-April. Manhattan-based Vista Realty Partners is planning a new 110,000-square-foot air cargo warehouse on the northern end of John F. Kennedy International Airport that would be the first warehouse development there in almost a decade. At $125 to $150 per square foot in construction costs, the project, which is set to break ground in September and which does not yet have a tenant, signals the developer's optimism about the market's recovery. A former Prospect Heights property owner is claiming to own the air rights to a part of the site where Bruce Ratner plans to build his new Nets arena and is suing the state for trying to take it. Peter Williams, who already handed over his property to Ratner in exchange for cash, said the state never condemned his air rights above and around 24 Sixth Avenue when it took the building through eminent domain and that the embattled Atlantic Yards project cannot move forward until the issue is settled. 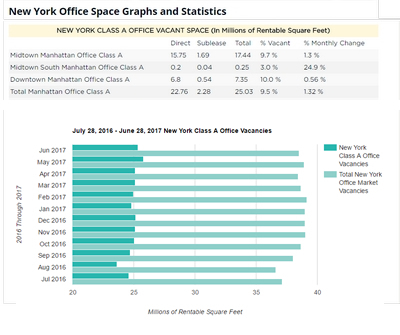 Financial firms continue to dominate Manhattan's largest tenant roster, filling the top four spots last year (see the top 15 biggest office tenants by square feet occupied after the jump). The four companies with the biggest footprints were JPMorgan Chase with 6.24 million square feet, Merrill Lynch with 3.49 million square feet, Goldman Sachs with 3.21 million square feet and Citi with 2.92 million square feet. 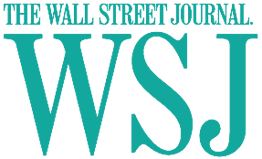 23 Wall Street now sits mostly empty after being acquired by a joint Angolan and Chinese venture. China Sonangol International Holding, which has ties both to Angola's state Oil Company and the Chinese intelligence community, acquired the property from a subsidiary of Lev Leviev's Africa Israel Investments in late 2008 for $150 million. Africa Israel still manages the property, but its interior renovation is now considered one of the city's stalled construction sites. Tavern on the Green Talks over the future of Central Park's famed Tavern on the Green restaurant are deadlocked after a meeting at Gracie Mansion took a bitter turn. Present at the meeting were new license holder who was "intransigent" and Local 6 union chief who the source called "belligerent." The New School's planned University Center, a 16-story dormitory and classroom facility on the corner of 14th Street and Fifth Avenue, is being held up by a labor dispute. Extell Development is set to break ground on a $1.3 billion skyscraper. The 1,005-foot-tall building on 57th Street near Seventh Avenue will become the tallest residential building in the city. A 210-room Park Hyatt is to occupy the first 20 floors of the building, while the rest of the tower will contain 136 high-end apartments. The Related Companies have a new financial partner for its $1 billion Hudson Yards development deal, which was approved by the board of the Metropolitan Transportation Authority and signed. Canada's Oxford Properties Group, the real estate and investment and development arm of the Ontario public retirement fund, will join Related in forking over an additional $21.75 million in deposits as its new general partner. Plans for the 26-acre site call for 12 million square feet of commercial and residential space that including 5,000 apartments, a hotel, public school and around 12 acres of public open space. The board of the Whitney Museum of American Art voted to begin construction on a building in the Meatpacking district in Manhattan that will increase the size and scope of the 80-year-old institution. Ground will be broken next year, with completion for 2015. The board also agreed to sell a group of brownstones adjacent to the museum's Marcel Breuer-designed building on Madison Avenue and 75th Street, and its annex building around the corner on 74th Street. 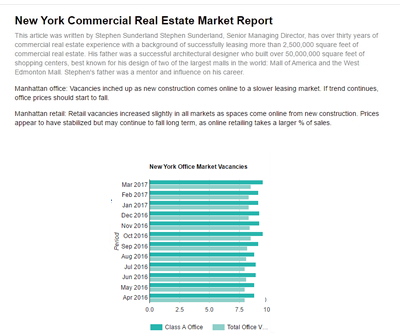 A New York City index which will track the 21 buildings favored by hedge funds, investment management firms and other related financial services companies. 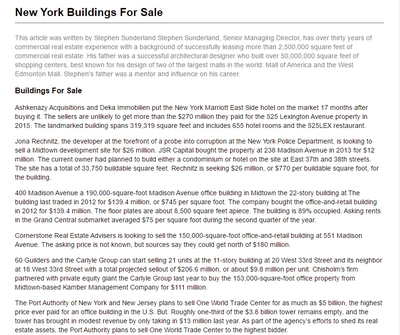 Among those on the list are 350 Park Avenue and the Lever House at 390 Park Avenue. 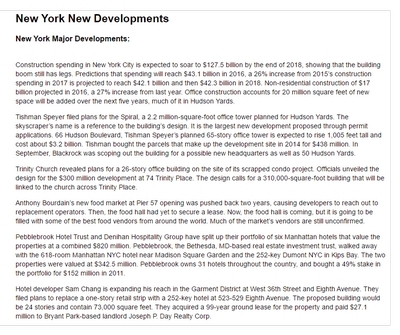 The list includes buildings which are either on or east of Fifth Avenue, except for one at 888 Seventh Avenue. 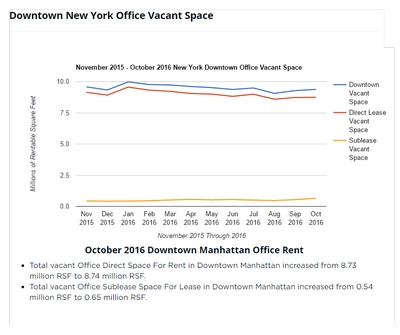 Two of the buildings are full, and nine of the 19 buildings with space available, asking rents exceed $100 per square foot. 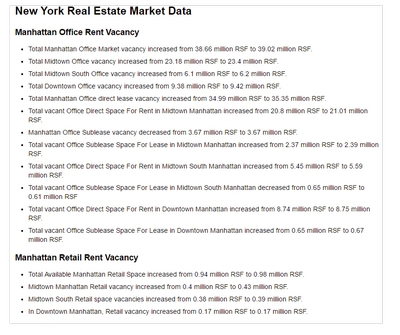 The highest priced building in the city is 9 W. 57th Street, where asking rents are as high as $180 a square foot. 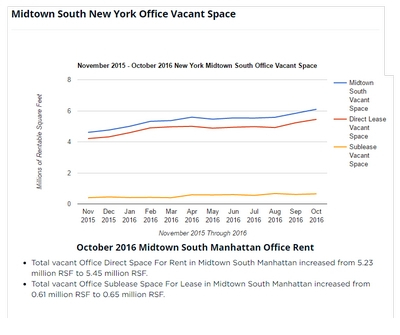 Asking rents are as high as $120 a square foot at the Seagram Building at 375 Park Ave. and at the IBM Building at 590 Madison Avenue. As confidence in the market has grown, rents at 375 Park Avenue have been raised three times since the beginning of the year. However, there are still some relative bargains to be had. Asking rents at the low end average $68 a square foot compared to $98 a square foot at the high end. But the less expensive space is discounted for a reason. It typically is only offered on a sublease or is located on lower floors which lack the views and light that are signature elements of some of these buildings. Extell Development has begun the review process from the City Planning Commission for its Riverside Center project, the 2,500-unit apartment plus 210,000-square-foot retail complex on the southern portion of the company's Hudson River site. Extell decreased some of the building height in response to community criticisms and is working with the Carlyle Group on the project, which also calls for a movie theater, an auto showroom, a K-8 school, a hotel and upwards of three acres of open space. The city's Economic Development Corporation issued a request for proposal for a developer to construct a new building for the National Jazz Museum and ImageNation Sol Cinema in Harlem. The city-owned a 10,000-square-foot abandoned site and was the former home of Mart 125, at 260 West 125th St, between Adam Clayton Powell Jr. and Frederick Douglass boulevards. Kimber Barton hopes to leave his legacy on East 9th Street by transforming the vacant P.S. 64 into the Tower School, a non-profit, independent school for 600 students that could open next fall. The old P.S. 64 at 605 East 9th Street off Tompkins Square Park is up for sale but is also being offered for long-term lease with an option to buy. The building's owner had wanted to create a mega dorm by adding a 23-story tower to the site, but his plans were rejected by the city. The World-Wide Group and the city cut the ribbon on a $500 million, 900,000-square-foot mixed-use development in Midtown after a major budget cut, and a reduction in size of a Whole Foods Market slated for the site. World-Wide and the New York City Educational Construction Fund slashed the budget by $100 million, shrunk the size of the space slated for Whole Foods at 250 East 57th Street by about 10,000 square feet to 38,000 square feet and cut the amount of excavation required by 30 feet through the redesign of the entire retail space and the space for two schools. If pedestrian traffic seems denser in Union Square, there's a reason. 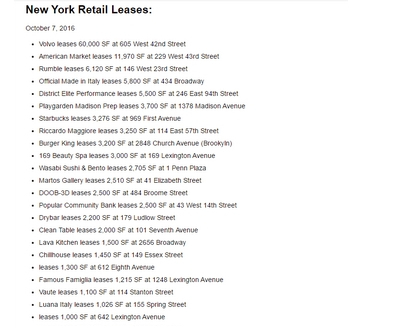 The glut of chain retailers and eateries, including Nordstrom Rack, Chipotle and T.G.I. Friday's, in the neighborhood has caused a spike in the number of visitors coming to the area in recent years. 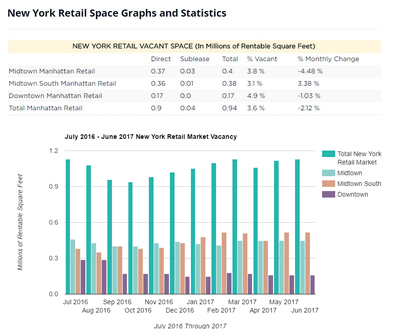 Foot traffic jumped 59 percent between 2003 and 2008, while the number of subway passengers coming to the area has increased 42 percent over the last decade. A new 486,000-square-foot commercial bioscience research center is being developed at the Brooklyn Army Terminal in Sunset Park. The project, which is being developed through a partnership between Mayor Michael Bloomberg's office, the New York City Economic Development Corporation and the State University of New York, has received $12 million in city funds and an additional $48 million in state capital. The state agency that licenses real estate brokers opened an investigation into two of the city's top retail brokers based on court testimony from one of them saying that about a decade ago they accepted a $100,000 cash commission in order to avoid paying income taxes. The state Department of State began looking at the commission fee to brokers Jeff Winick, CEO of Winick Realty Group, and Cory Zelnik, CEO of Zelnik & Company following testimony from Zelnik in April that they took the cash commission with the purpose of avoiding taxes. Non-payment of taxes is a demonstration of untrustworthiness under the state's real property laws. Zelnik was president of Winick Realty until 2006. After nearly three years of controversy, the landmark Apthorp condominium on the Upper West Side has won approval from the state Attorney General's office to commence closing apartment contracts. Attorney General Andrew Cuomo's office signed off on the conversion, following a nine-month investigation into the relationship between the contracted buyers and the development team, led by Lev Leviev's Africa Israel, the Israeli-based real estate and diamond conglomerate. Multi-million dollar heir Neil Bender won a major coup when an appellate court ruled that he was fit to manage the 150-property Manhattan real estate portfolio that once belonged to his late uncle William Gottlieb. His relatives have tried to wrest the collection of properties, including the Keller Hotel, the Northern Dispensary and the New Holland Hotel, located mostly in the West Village and Meatpacking District, from his control since July 2007, in a public family feud. 1280 Fifth Avenue weaves: a museum and a new Fifth Avenue condo in Harlem. The building sits along a roundabout at 110th Street and Fifth Avenue, a spot to lure buyers eager to live near Museum Mile and across the street from Central Park. The developer understood that it was important that the building have architectural integrity. Former U.S. Marshal Eugene Corcoran has been named the Deputy Commissioner of Enforcement with the Department of Buildings, marking the first time that the DOB has appointed a former law enforcement official to its senior leadership team. Corcoran's appointment comes on the heels of accusations of corruption and mismanagement directed at the DOB, along with a series of gaffes including the deadly Deutsche Bank fire in 2007, the Azure crane collapse at 333 East 91st Street in 2008 and the subsequent allegations of bribery against a top-ranking city crane inspector. Harlem's PS90, the abandoned public elementary school-turned-condominium at 220 West 148th Street between Adam Clayton Powell and Frederick Douglass boulevards, has been approved for Federal Housing Administration financing, the development team announced. Sales launched in September at the 75-unit building, which is still under construction. Starwood Capital Group's bid for the bankrupt Extended Stay hotel chain, was better than the bid from a competing group led by Centerbridge Partners and Paulson & Co. Yesterday marked the deadline to submit a bid on Extended Stay's holdings. 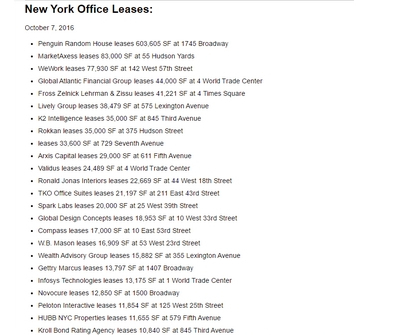 1.28 million square feet, Viacom's lease renewal at SL Green's 1515 Broadway marked the biggest office lease of 2009. 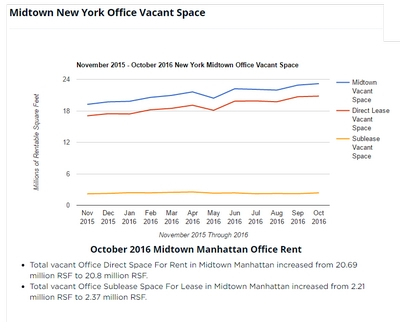 The second biggest lease last year was the 550,000-square-foot renewal for Paul, Weiss, Rifkind, Wharton & Garrison at 1285 Sixth Avenue. Third up was Penguin Group USA's renewal and expansion lease at 372 Hudson Street for 297,980 square feet.